Senator Lindsey Graham sent a letter on Thursday to Assistant Attorney General Rod Rosenstein about whether Rosenstein should recuse himself from the Mueller investigation due to his obvious conflicts with the case. Graham should also request information about Rosenstein’s wife who represented the Clintons in the past. Top Republican Senator Lindsey Graham is pressing Deputy Attorney General Rod Rosenstein on whether the Justice Department official should recuse himself from the Robert Mueller investigation due to his own connections to the case. In a letter obtained by Fox News, Graham, R-S.C., asked Rosenstein whether he considers himself a “potential witness” in the Mueller probe in connection with the firing of FBI Director James Comey. Graham, in the May 31-dated letter, cited reports that Mueller’s investigation is looking at whether President Trump obstructed justice by firing Comey – and the fact that Trump relied on a Rosenstein-authored memo to justify the firing. Rosenstein’s role was further detailed in a New York Times report earlier this week on a memo written by ousted FBI official Andrew McCabe. Fox News has confirmed that the memo described a meeting where Rosenstein claimed Trump had asked him to reference Russia in his recommendation to fire Comey. Rosenstein declined, and instead focused on Comey’s handling of the Hillary Clinton email probe. Trump pushed back on the account Thursday. “Not that it matters but I never fired James Comey because of Russia! The Corrupt Mainstream media loves to keep pushing that narrative, but they know it is not true!” Trump tweeted. Rosenstein has many conflicts of interest related to the Mueller investigation as well as Mueller and Mueller’s entire team as we pointed out in early May. The Mueller investigation is arguably the most one-sided and conflicted group of lawyers and investigators in history. They all are conflicted. But Rosenstein may be more conflicted than the entire gang. Rosenstein wrote the letter for President Trump recommending Comey’s firing. This alone should disqualify him and the entire investigation from taking place. 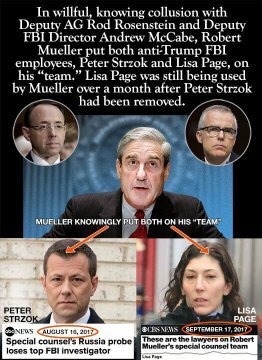 Rosenstein and Mueller were both heavily involved in the Uranium One case where the Obama Administration and his Secretary of State Hillary Clinton allowed the sale of 20% of the US’s uranium to Russia. This was the Russian scandal involving our government. This is what the DOJ should be investigating and Rosenstein should recuse himself from that as well. But one other conflict of interest that Rosenstein has is related to his wife. Rosenstein’s wife, Lisa Barsoomian, represented Bill Clinton in a case in the 1990’s. This alone should be enough for Rosenstein to be unqualified for any role related to the Clintons, Obama or their cronies. Allow myself to introduce myself – it’s like Mueller is inspector clouseau yet the media can’t see it. The rules for recusal are clear. There are legal statutes for this. The fact that this case has so many material conflicts of interest automatically makes it a sham and farce. The entire Mueller investigation should be thrown out just for Rosenstein’s conflicts, let alone the rest of the Mueller team of thugs. Rosenstein’s wife is enough reason for him to recuse himself!